Vandenberg Air Force Base is a United States Air Force Base located 9.2 miles northwest of Lompoc, California. It is under the jurisdiction of the 30th Space Wing, Air Force Space Command (AFSPC). Vandenberg AFB is a Department of Defense space and missile testing base, with a mission of placing satellites into polar orbit from the West Coast using expendable boosters (Pegasus, Taurus, Minotaur, Atlas V, Delta IV and now SpaceX's Falcon). Wing personnel also support the Service's LGM-30G Minuteman III Intercontinental Ballistic Missile Force Development Evaluation program. The host unit at Vandenberg AFB is the 30th Space Wing. The 30th SW is home to the Western Range, manages Department of Defense space and missile testing, and places satellites into near-polar orbits from the West Coast. Wing personnel also support the Air Force's Minuteman III Intercontinental Ballistic Missile Force Development Test and Evaluation program. The Western Range begins at the coastal boundaries of Vandenberg and extends westward from the California coast to the Western Pacific, including sites in Hawaii. Operations involve dozens of federal and commercial interests. The 30th Launch Group is responsible for booster and satellite technical oversight and launch processing activities to include launch, integration and test operations. The group consists of an integrated military, civilian and contractor team with more than 250 personnel directly supporting operations from the Western Range. The 30th Operations Group provides the core capability for West Coast spacelift and range operations. Operations professionals are responsible for operating and maintaining the Western Range for spacelift, missile test launch, aeronautical and space surveillance missions. Learn More About Vandenberg Air Force Base HERE!! FR CANTEEN MISSION STATEMENT~Showing support and boosting the morale of our military and our allies military and the family members of the above. Honoring those who have served before. Please remember: The Canteen is a place to honor and entertain our troops. The Canteen is family friendly. Let's have fun! We pray for your continued strength, to be strong in the face of adversity. We pray for your safety, that you will return to your families and friends soon. We pray that your hope, courage, and dignity remain unbroken, so that you may show others the way. I remember reading his posts over the years. Always very erudite and witty. I didn’t know that he was ill. He just stopped posting on 3/8. He was a very intellectual and funny guy. He was overweight but hey.. I’m underweight. I was not close, but can vouch that he was a good guy. I just looked up “Hearst mansion images” and there it was. I’m overweight. It’s not the WORST thing, but it doesn’t help. Seriously I think he would like this. The man had a degree in English Lit. Neat that you got a tour of the base. Bet that was fun. FReepers, it's far beyond time to wrap up this FReep-a-thon. Lets do it today. Please chip in. President Donald J. Trump's address to the United Nations on 09/19/2017. Ramirez political cartoon: Tillerson You're Fired LARGE VERSION 03/18/2018: LINK LINK to regular sized versions of his political cartoons (archive). 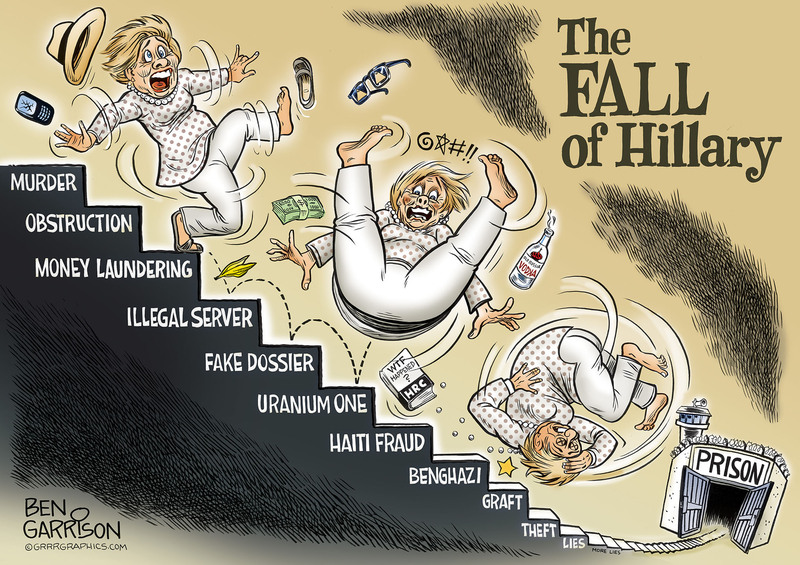 Garrison political cartoon: the Fall of Hillary LARGE VERSION 03/15/2018: LINK LINK (scroll down) to regular sized versions of his political cartoons (archive). FReepers, 94.903% of the First Quarter FReep-a-thon goal has been met. Click above and pencil in your donation now. Please folks, lets end this FReepathon. Thank you! Me too! 21 years on the old Titan program. 1984-2005. We lived in Santa Maria. Vandenberg is the west coast launch platform for missiles and rockets, but did you know why? The following IS rocket science, but it’s also understandable. I hope. The earth rotates from west to east - so we see the sun apparently rise in the east and go overhead and set in the west. So, the earth’s surface at the equator is moving about 1000 miles per hour form west to east. The early rockets were terribly underpowered and needed all the help they can get to reach orbital speed. So, they, like Jules Verne forecast in the 1880’s, launched from as close to the equator as possible, and launched eastward from the Florida coast so the flightpath went over the (unpopulated) Atlantic. Now, once in orbit, you can use rocket fuel to (slightly) change orbital paths, but that takes a LOT of fuel that you have launch into orbit as well. it’s much more profitable to keep the satelliete weight weight as low as possible, not to rely on re-starting rocket engines in space after launch and orbit, and just point the thing in the right direction in the first place. SO, if you launch due east from Cape Canaveral, your orbit begin at the Cape, then angles “down” south over the equator to an equal distance south of the equator (-26 degreees or so), then curves back up to again be back over the Cape’s latitude. But many miles further back. that’s why you see the NASA’s curves when they show the orbit: each orbit is a little bit further back than the previous, but each starts at the Cape’s latitude and wiggles back and forth. Not bad if you want your satellite to go over the equator. To fly over any region from +25 latitude to -25 latitude. Real bad if you want to photograph Lenningrad, Moscow, Siberia, north China, or North Korea, Germany, or Murmansk. So, to fly over the north pole, you need to launch due south. Get into orbit, and let the earth rotate underneath your satellite cameras. But the residents of Miami, Bermuda, etc will get irritated when your rocket falls on their head. Launching east from a spot closer to the equator gives you a little bit more speed = That is why the French launch from Guiana, not Marseilles or Paris or Normandy. That - and not to drop rockets and boosters on Germany, Poland and Russia. But, the “south coast” of California is actually running nearly west-east. So, if you launch south from the west of California, your satellite camera will eventually fly over each part of the pole and Russia and China. Good for polar research too. You can’t quite get due north over the pole, but you can get close. The “research launches” for anti-missile testing are aimed out over the Pacific towards the launch sites in Polynesia too. So that why you launch south from the west coast to spy on Russia to the north coast. You’ve been lucky enough to see a lot more than a lot of us. I’ve only seen a bit of Camp Lejeune when I was married to my first husband eons ago (he was stationed there) and was lucky enough to get invited for a tour of Arnold AFB, which is close to us here. It’s primarily a R&D canter and we got to see some of the test facilities. It was cool seeing the huge wind tunnel where Dad worked for many years. LOL! I fell right into that one and didn’t even realize it. Was a little distracted by a thunderstorm at the Berry nest at the time. Had a meeting today with a web guy and a backer of my work. Lots to do and I am coming up with 5 more designs. I have to have a back up for slow times. Praying this will be it. I have been lucky in that respect. The down side is that they always live so far away. My son is pushing hard to get us to move up to WY, but man! I just don’t see THAT happening. LOL! I get chilled just thinking about it. it was snowing there in JH today! EEK! I’ve always wanted to see Camp Lejeune. I have been to NC, but not to their facility. 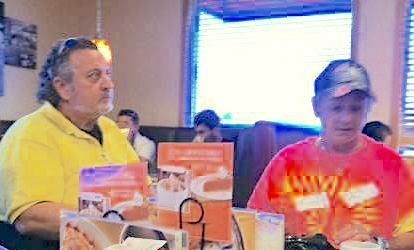 We were in Gastonia snd in Ashville, visiting friends we’d met in Germany. Yes, them living so far away is a downside indeed. Your parents probably felt the same way when you and your hubby were at different bases. Nope, somehow I don’t see you moving to WY. You always say you wish you could have some cool weather but that’s a bit beyond cool! LOL! Camp Lejeune is huge. We lived off base at Sneads Ferry, which is not far from the back gate. We had one car and I had to take him to work and pick him up on days I needed the car and it was quite a drive all the way through the base to get to the building he worked in.